See Jeff and Dav create a story smashup before a live kid audience. Then tell us how YOU think the story should end for your chance to win the GRAND PRIZE..! CAPTAIN UNDERPANTS ™/® Dav Pilkey. All rights reserved. © 2013 Wimpy Kid, Inc. All rights reserved. Learn more about Jeff Kinney, creator of the Diary of a Wimpy Kid series! 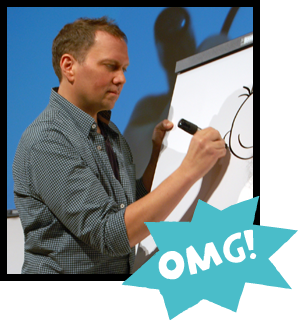 Learn more about Dav Pilkey, creator of the Captain Underpants series! Scholastic Reading Club members, click here for special classroom offers. Turn this event into an exciting classroom experience. Submit entries by February 14, 2014. One Grand-Prize Winner will have his or her entry framed with the existing panels, autographed by the authors themselves. 10 Runners-Up will receive their very own graphic storytelling extravaganza book collections! NO PURCHASE NECESSARY. All students in grades 2 through 8 in a U.S. school who are legal U.S. residents are eligible to enter, except those who have family members employed by Scholastic Inc. Every entry MUST include student name, teacher name, grade/age, school name, address and phone number and mailed to: Mash-Up Mini-Story Cliffhanger Contest, P.O. Box 714, New York, NY, 10013-0714. One (1) Grand Prize Winner (approx. retail value: $300) and ten (10) Runners Up (approximate retail value: $75) will be selected based on clarity of thought, execution and creativity. Winners will be notified on or about March 13, 2014. Complete rules: scholastic.com/clubcontests. Void where prohibited. Jeff Kinney is the bestselling author of the Diary of a Wimpy Kid series, which has over 85 million copies in print in 44 languages around the world. Diary of a Wimpy Kid won Favorite Book at the Nickelodeon Kids' Choice Awards three times, and Jeff was twice voted Author of the Year at the Children's Choice Book Awards. Jeff was also named one of Time magazine's 100 Most Influential People in the World and is the creator of Poptropica.com, a virtual world for kids. He lives in Massachusetts with his wife and two sons. Can Jeff draw Greg...blindfolded? Tune in to the webcast to see how close he gets–no peaking, Jeff! Wimpy Kid text and illustrations copyright © 2013 Wimpy Kid, Inc. DIARY OF A WIMPY KID®, WIMPY KID™, and the Greg Heffley design™ are trademarks of Wimpy Kid, Inc. All rights reserved. The NEW Captain Underpants is here– and in FULL-COLOR! These two elementary school rebels will make you laugh out loud. Dav tries his hand at drawing Jeff's Wimpy Kid. Tune in to the webcast– who knows what he'll come up with! CAPTAIN UNDERPANTS ™/® Dav Pilkey. All rights reserved.